In this op-ed Shima Silavi, Executive Director of Ahwaz Human Rights Organisation (AHRO), gives her response to the recently published draft of the Annual Report on Human Rights and Democracy in the World and the European Union’s Policy on the Matter for 2017. She criticises the EU's failure to explicitly condemn Iran's multiple human rights violations, including executions and enforced disappearances. She goes on to more generall condemn the EU's failure to intervene in numerous Middle Eastern human rights crises, calling attention to the ineffectiveness of soft power and open-trade policies when dealing with regimes such as Iran. Finally, she concludes that the EU's repeated inaction has led to a loss of reputation in the Middle East. On July 2018, the European Parliament’s Subcommittee on Human Rights (DROI) met to discuss the draft of the Annual Report on Human Rights and Democracy in the World and the European Union’s Policy on the Matter for 2017. Reading through the report, it becomes evident that EU has become less and less committed to its founding principles. Only the first 13 pages of the 32-page document are actually dedicated to listing and condemning the various human rights violations being committed around the world. The rest of the report is divided in 2 annexes. One, on individual cases raised by the European Parliament; the other on a list of resolutions relating directly or indirectly to human rights violations adopted by the European Parliament during the year 2017 . Being an Iranian human rights activist myself, I was quite surprised to learn that the name of the Islamic Republic of Iran was absent in the report and that not a single individual case was raised by the European Parliament. This negligence is particularly worrying in light of the fact that, during the reported period, a long list of cases was submitted to EU, raising awareness of cases such as that of Ramin Hossein Panahi and VUB (Free University of Brussels) university professor Dr. Ahmad Reza Djalali, both in danger of imminent execution, as well as the case of Mr Yousef Silavi, victim of enforced disappearance since 2009. In the cases of Ramin Hossein Panahi and Mohammad Salas – the Gonabadi Darwish who was executed months ago – MEPs even wrote an official letter to the Iranian Embassy in Brussels condemning and calling for the release of these individuals, while their names were mentioned during European Parliament’s “exchange of views” committee meetings on human rights (DROI) and foreign affairs (AFET). The other point that drew my attention in this report is the double standard of EU in regards to execution in different Middle Eastern counties. Although more than half of executions in the Middle East are committed in Iran, the EU has only issued a resolution against execution in Kuwait and Bahrain. The European Parliament’s blatant negligence of the deteriorating human rights situation in Iran has deep consequences. The fact that Brussels has not taken a stand to address the matter while blindly continuing to support the nuclear deal without any regard to the lives of millions of Iranians inside shows how far the EU will go in sacrificing its principles for short-term economic benefits. The EU claims to be united and firmly committed on the principles of human rights, democracy and the rule of law. However, it has repeatedly disregarded Iran’s terrifying number of executions, torture, public lashing, stoning, women’s rights violations, persecution of ethnic and religious minorities, etc. Is a country with this record a suitable partner for the EU? Is it possible to have growth and development plans in a country that undermines social justice and individual and collective rights in all its shapes and form? It is no secret that the EU is going through an existential crisis as it is trying to stay united despite internal problems such as the rise of far-right parties and Brexit. The European Union has never been independent nor bold in its relations with the Middle East, without any positive strong effect the region so far. In the majority of cases, such as the war in Iraq or the fight against ISIS, the EU merely followed the US’ lead, never really imposing itself as a true partner in establishing democracy nor as a key player in helping Middle East countries to achieve stability. All this is despite the fact that the EU shares borders with the Middle East and, following any crisis in the region, dealing with refugees becomes yet another internal problem for the EU. Germany has received the highest number of refugees, triggering heavy criticism of Angela Merkel, both from German taxpayers as well as from other EU member states. Iran and Turkey know that well and do not refrain from using this to blackmail the EU: Ankara, on one hand, threatens Europe with 4 million Syrian refugees while Tehran does the same with Afghan refugees. Another threat Iran uses against the EU is in regard to drug-trafficking. When Alaeddin Boroujerdi, Chairman for the Committee for Foreign Policy and National Security of the Iranian Parliament, visited the European Parliament for an exchange of views with the AFET committee on 23 January 2018, he openly used threatening language by saying that “if the EU wants us to stop the executions, it means that European countries have become a battlefield of drug dealers”. Against this backdrop the EU, which cannot resist the threats of Turkey or Iran, was unable to bring positive change in solving the multiple crises in the Middle East and has failed all people who thought the EU was at least committed to its principles. Instead, it is clear that Brussels wants to show to the world that it is independent from the United States by keeping relations with Iran and by staying in the nuclear deal in close cooperation with the Mullahs, whose corruption and monopoly-orientation has destroyed Iran’s economy. The EU believes that its soft power compensates for its military weakness. However, a quick glimpse at the history of Europe in dealing with the Syrian regime based on open-market policies confirms that the EU’s approach not only failed to help the Syrian people but also lead to the establishment of what is known in Syria as “parasite bourgeoisie”: individuals who earned their capital not under a fair and equal competition, but through direct and shady connections with the system, being totally dependent on the government. This “parasite” class has been even able to change their business according to the situation. During peace times, they benefited through the importing of goods that were illegal (such as computers) so that the price remained high, favouring only a small part of the population. During war times, they moved on to become war businessmen and even helped the regime to produce and import weapons such as chlorine bombs. Without a doubt, in any future that demands change for the Syrian people, this class will certainly oppose the wellbeing and will of the people. Europe is today repeating the same policy with Iran which failed in Syria: a naive belief that open-market policies and soft power will convince the Iranian regime to reform and that an expanding middle-class will fuel the change. However, the EU is forgetting that any middle-class created depends on the system and that this class will support the regime no matter how undemocratic the regime is. Even in the recent demonstrations in Iran, the middle-class was not at the scene. Disconnected from reality and manipulated by so-called “reformists”, the EU has been deceived into thinking the Reformists are different from the Conservatives. On 17 July 2018, Reza Khatami, the former General-Secretary of the Islamic Iran Participation Front (a reformist Party), said that Reformists are not ashamed to say that they are safety valves of the regime. 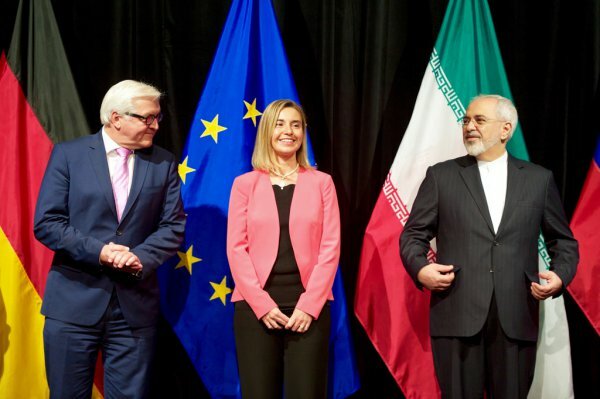 What we see today is that Iran has become a playground for EU member states to show their independence from the US. The price to pay, however, is that Brussels’ continuing support to Tehran and deliberate disregard for human rights violations has jeopardised its reputation with the people of the Middle East, who time after time see their dictators being warmly welcomed by European politicians at EU institutions.